Savage Camper attended FWC’s 2018 Norcal Customer Rally held in Bodega Bay, CA. One of the couples we met, were Natasha and Dominik. Dominik started off originally with a Toyota Tacoma and an FRP (FlipPac) camper shell on the back. However, it wasn’t long before he realized he wanted something more roomy. “I spent alot of time in Colombia River Gorge” states Dominik. “I didn’t mind getting wet during the day, but at the end of the day you want to dry off and have something comfortable.” So, Dominik upgraded to a FWC Fleet shell model camper, performing all of the upgrades himself, including cabinetry and solar. Once Natasha came along, they both really enjoyed spending alot of time in the mountains, especially during the winter. How confined their space was in the Fleet camper was something they wanted to remedy, so they decided to go all out. Dominik and Natasha purchased a 2018 Ford F-350 Lariat, added a nice Hillsboro flatbed and topped it with FWC’s Grandy Flatbed model. Once we first stepped inside the Grandy, Dominik pointed out the large amount of floor space. 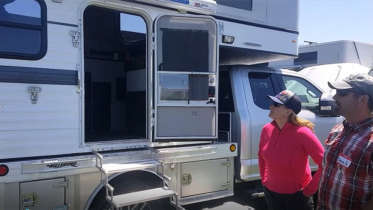 “It’s big enough where last night, when the wind picked up, we had 5 people and a dog sitting in the camper”, he said before walking us through the camper’s controls, including a thermostat, battery, water pump & heater. Dominik installed a 240 Watt solar panel, an MTTP charge controller and a 2000 Watt pure sine wave inverter. He also upgraded the battery storage to 300 Amp Hours and added 110V AC & USB Ports. 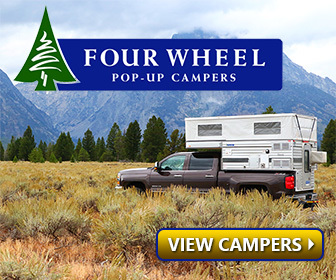 We moved on to some of the Four Wheel Camper’s other features, like the large storage space under the bed, the flush-mount sink and stove, storage and a large isotherm refrigerator. The final features Natasha showed us included the large amount of storage under the seat cushions, and some really cool in-floor storage where they adapted storage bins. They also added some hydraulic shocks to hold the doors open. Be the first to comment on "2018 Ford F350 Lariat with Four Wheel Camper Grandby & Hillsboro Flatbed"